Dens are becoming the most desirable gathering room in the modern home where family members, friends and guests all gather to watch TV, read books, listen to their favorite music and talk about how their day went. Modern families use the Den more than their formal Living or dining rooms. 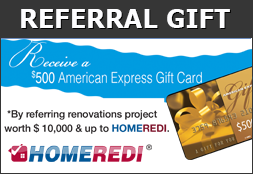 During the course of each year HOMEREDI crew renovates more than a dozen such living spaces by removing old wood paneling and installing new Sheetrock, new electrical outlets for entertainment centers with dimmer function hi-efficiency LED low voltage Hi-Hats.